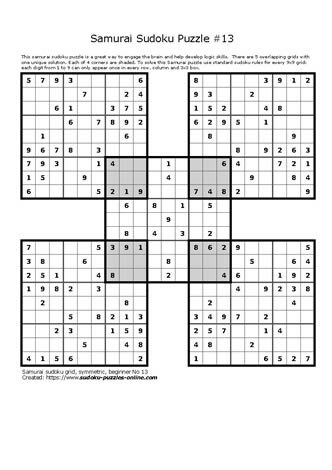 This samurai sudoku puzzle includes the usual 5 interlaced sudoku grids that result in one unique solution. Logic is used, in conjunction with basic sudoku rules, to solve this fiendish puzzle. 2. Digits can only occur one in each row, column and 3x3 subgrid within the larger puzzle.